This is an all-time classic. 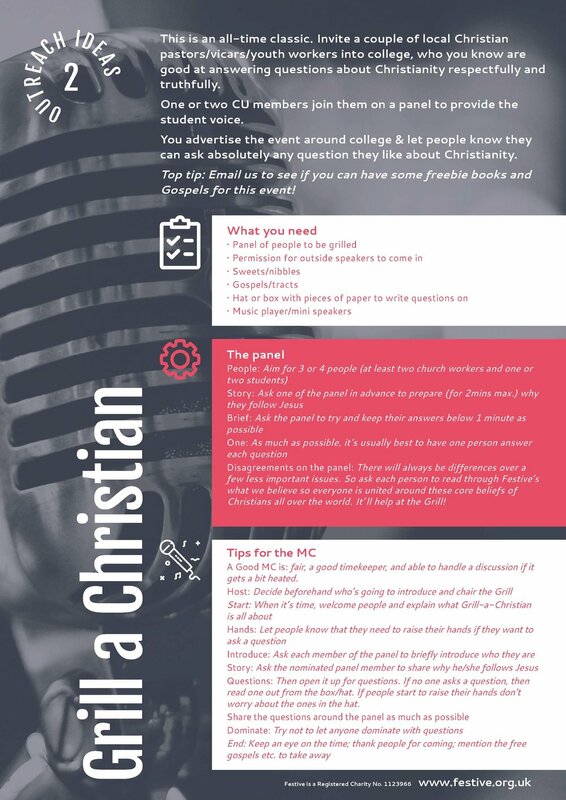 Invite a couple of local Christian pastors/vicars/youth workers into college, who you know are good at answering questions about Christianity respectfully and truthfully. One or two CU members join them on a panel to provide the student voice. You advertise the event around college & let people know they can ask absolutely any question they like about Christianity. Top tip: Email us to see if you can have some freebie books and Gospels for this event! Disagreements on the panel: There will always be differences over a few less important issues. So ask each person to read through Festive’s what we believe so everyone is united around these core beliefs of Christians all over the world. It’ll help at the Grill! A Good MC is: fair, a good timekeeper, and able to handle a discussion if it gets a bit heated.